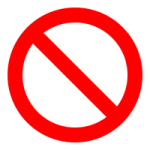 In all the years I’ve been operating my own business (since 1997) one thing that’s been a consistent challenge for my coaching clients and audiences is saying no. I recently presented an updated program on Boundary-Setting and, of course, once again we tackled the issues around saying no. As a result, I’ve revised an article I was working on so that I can share it with audience members. Here I share part of it with you. If you’d like the complete article, please email me at [email protected] and ask for the “Saying No” article. Saying “no” enables you to say “yes” to what matters most in your life. “No” is one the most powerful two-letter words in the English language! However, saying “no” doesn’t come naturally for most people. We are conditioned to say “yes”, be agreeable and easy to work with. If you’re one of those people who normally says “yes” when asked to do something or take responsibility for a new work project, sit on another school or church committee, become scout leader, be the baseball coach, or bake cookies for the local fundraiser or anything that will likely require more time than you realistically have available, than you need to first understand why you are prone to say yes so quickly and then learn more effective ways to say no. …believe we can “do it all”. If any of the reasons above describe you, saying no will undoubtedly make you feel uncomfortable or inadequate. There may be other reasons in addition to those listed, so be sure to recognize what prompts you to say yes, or avoid saying no. When you begin feeling totally overwhelmed, exhausted, resentful, and taken advantage of your attitude and productivity will likely suffer. If your life is overrun with responsibilities, jobs and commitments there’s little time left for your own tasks, fun and relaxation. One way to pare down your schedule is to get good at saying no to new commitments. If you want more than ten super techniques to help you say no, remember to email me at [email protected]! + and, avoid making excuses (especially lengthy ones!). Natalie Gahrmann wrote this article.